Meade 8" Equatorial Wedge #07002. Allows for polar alignment of Meade 8" model ACF and SC models, as required for long exposure astrophotography and imaging. For use with Meade Field Tripods as supplied with compatible models. Compatible with Meade LX90 models with addition of LX90 Wedge Adapter, item 07389. Equatorial alignment is required for astrophotography and imaging exposures longer than about 5 minutes. 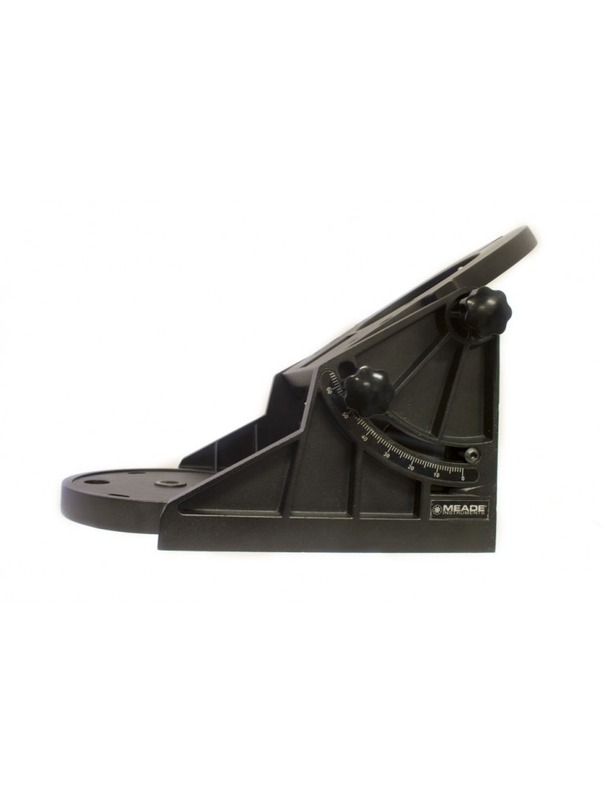 The Meade 8" Wedge is mounted between a telescope and the tripod to accomplish the tilt of an equatorial type mount that matches the observer's latitude and permits precise polar alignment of your telescope. The wedge allows the astrophotographer to align the telescope's axis of rotation with the Earth's axis of rotation. This alignment eliminates stars in your long exposure photograph from appearing as a long arc, trail or streak due to an effect known as field rotation. For images under approximately 5 minutes a wedge is not necessary and the telescope can be set up in altitude-azimuth (alt-az) configuration as normally used for visual observation. Features heavy duty cast aluminum construction with latitude and longitude fine adjustments and a compass to use the magnetic pole as a starting reference. For use with the Meade field tripods as supplied with all compatible models. Recommended for 8” telescopes. Compatible with Meade SC and ACF models including 2080, LX50 and LX200. Adapter required for use with all LX90 models, available separately as item 07389.